The Active Aging Foundation is forming the Crawford County Corn-Hole League. Open registration for Individual Players is going on now. To join the league, your registration fee is only $20 per player and will be used to cover your first and last night player fees for the league. Player fees will be $10.00 per night and League play will start at 6:30 every Thursday night beginning February 9th through April 20th with the exception of March 9th which will be a bye week for the League. The Crawford County Corn-Hole League will be held at the Lew Davies Community Building located at 1034 Park Avenue in Meadville. 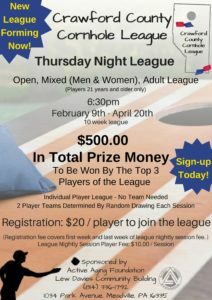 The league is an open, mixed adult league so you must be 21 or older to play and this will also be a BYOB league night. This will be an Individual Player League so you do not need to be part of a team to register. Teams will be made-up of 2 Individual Players each and will be determined by a random drawing at the beginning of play each Thursday night. There will be a total of $500.00 in Prize Money awarded to the top 3 players at the end of this 10 week league. So get your friends together and join us for all of the fun and excitement at Thursday Night Corn-Hole. For more information and/or registration forms for the Crawford County Corn-Hole League, stop by the offices of Active Aging at 1034 Park Avenue in Meadville or contact us at (814)336-1792 or toll free at 1-800-321-7705. You can also find additional information on our Facebook page, in our monthly newsletter the county Echo or on our website at activeaging.org.